Expedia can help you save loads with Siem Reap travel packages. With all that extra money in the bank, you might even like to book a few additional nights. 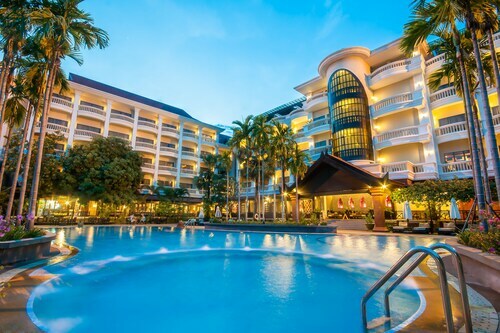 Secure your travel package on Expedia and save as much as 55%*. With more than 400 partner airlines and 321,000 properties worldwide for you to pick from on our extensive database, you'll be setting off on your next holiday in no time! We've got all the sizzling hot sightseeing tips for your forthcoming trip to Siem Reap. Grab your travel planner and get ready to start filling up your itinerary. If you only had one day in Siem Reap, you'd want to spend it soaking up the Angkor Wat. A remarkable attraction that you won't soon forget, it brings in scores of visitors from all around the world. Whether you're an enthusiastic green thumb or you simply like getting dirt under your nails, you can't go past Royal Garden for a bit of horticultural inspiration. This private display is filled with magnificent blooms and design ideas. Travellers in this destination are spoilt for choice. There's an excellent choice of interactive adventures on offer at Cambodian Cultural Village. It's sure to be a fun day out for the entire family! Still have time to spare? Got some cash to spend? Search for hidden treasures and score a few choice bargains at Angkor Night Market. A getaway is a terrific time to stop, rest and relax. It's also the ideal time to have some new experiences! Got a little time on your side? Visit our Siem Reap things to do page for a full list of activities. Wrap up your day of exciting adventures with a cosy bed and a fluffy pillow. 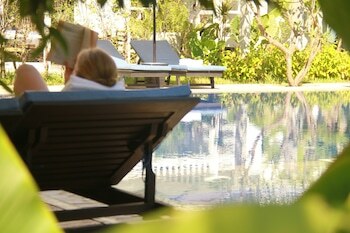 Peruse the 363 properties in Siem Reap on offer via Expedia and choose one for your luxury getaway or cheap holiday. 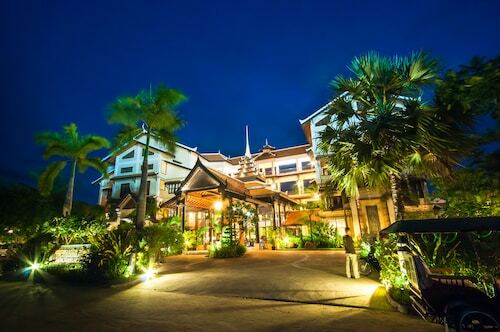 The Belmond La Résidence d'Angkor (River Road) and the Phum Baitang (Phum Svaydangkum, Sangkat Svaydangkum) are two of the higher-end choices in Siem Reap. Book a room at either and you're sure to have some of the nicest rooms in town. 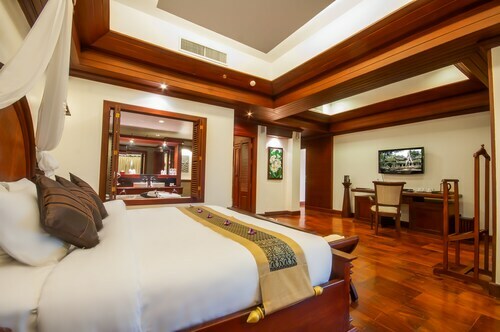 The Angkor Palace Resort & Spa (No 555 Phum Kruos) and the Royal Angkor Resort & Spa (Highway No. 6) both have high guest ratings if you'd like somewhere more economical. Organised the flights for your trip to Siem Reap yet? When you land, prepare to stroll out into Siem Reap International Airport (REP). It's 4 miles (6 km) from here to the downtown area. Experience the famous architecture and stunning history of this unique temple, located in the ancient ruins of Cambodia’s Khmer Empire. Visit the “Mona Lisa of Southeast Asia” in Angkor Archaeological Park’s exquisite temple. Experience the fusion of ancient architecture and the stunning Cambodian jungle in Angkor Archaeological Park’s enchanting historic temple. Packed with 287 ancient temples and centuries of ancient Khmer history, this World Heritage Site never fails to impress. 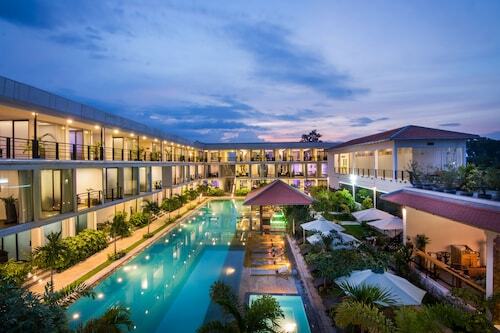 This family-friendly Siem Reap hotel is located near the airport, within 1 mi (2 km) of Charles de Gaulle Road and Royal Garden. Pub Street and Angkor Night Market are also within 2 miles (3 km). 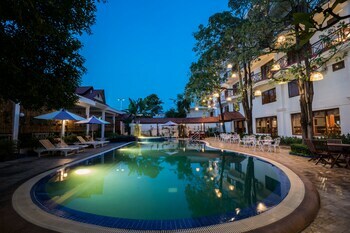 This family-friendly Siem Reap hotel is located near the airport, within 1 mi (2 km) of Shrine to Preah Ang Check and Preah Ang Chom, Pub Street and Royal Garden. Angkor Night Market and Cambodian Cultural Village are also within 3 miles (5 km). 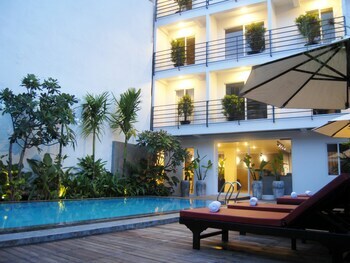 Located in the heart of Siem Reap, this luxury hotel is within a 10-minute walk of Pub Street and Angkor Night Market. Royal Garden and Angkor National Museum are also within 1 mi (2 km). 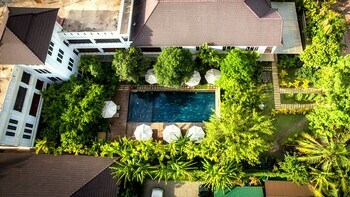 Located in Downtown Siem Reap, this luxury hotel is steps away from Charles de Gaulle Road and Royal Garden. Pub Street and Angkor Night Market are also within 1 mile (2 km). 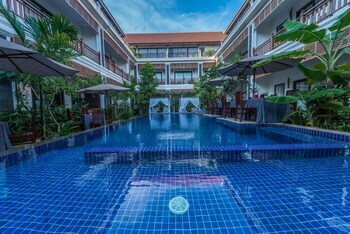 This family-friendly Siem Reap resort is located near the airport, within a 10-minute walk of Wat Damnak and Pub Street. Angkor Night Market and Royal Garden are also within 1 mile (2 km). Situated near the airport, this spa resort is 0.2 mi (0.3 km) from National Road 6 and within 3 miles (5 km) of Cambodian Cultural Village and Angkor Night Market. 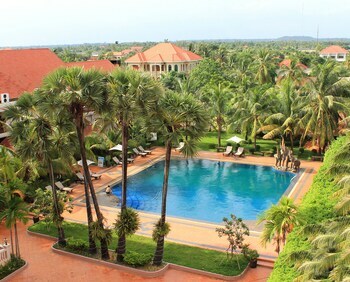 Angkor Golf Resort and Boxville Siem Reap are also within 2 miles (3 km). 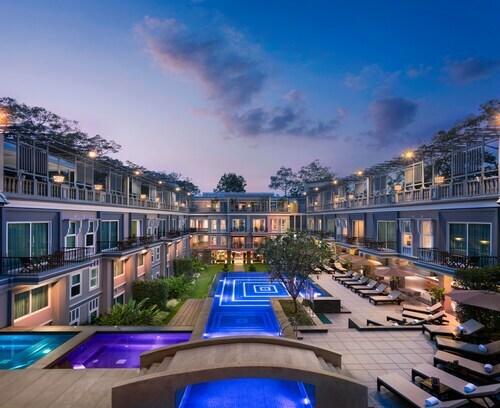 This family-friendly Siem Reap resort is located near the airport, within 1 mi (2 km) of Shrine to Preah Ang Check and Preah Ang Chom, Pub Street and Royal Garden. Angkor Night Market and Cambodian Cultural Village are also within 3 miles (5 km). 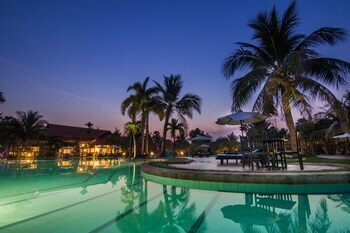 This family-friendly Siem Reap resort is located near the airport, within a 15-minute walk of Wat Damnak and Pub Street. Angkor Night Market and Royal Garden are also within 2 miles (3 km). Kuala Lumpur Intl. - Siem Reap Intl.